One person’s low-carbohydrate diet will look very different to another’s. When you eat low-carb, meals start to lose the distinction higher carbohydrate meals have. At some point in the 20th Century, marketers decided that some foods were breakfast foods and some should be defined as lunch. Therefore, breakfasts should be cereal and/or toast, and at mid-day you should eat sandwiches, or bread and soup for example. That means you need ready-made products – boxes of corn flakes, or packets of pre-prepared slices of bread filled with cheese, ham and various other choices. A low carb diet doesn’t usually include cereals and sandwiches, so anything can be eaten for breakfast or lunch. Leftovers from last night’s dinner, eggs and bacon for lunch – why limit yourself to a time of day food marketers have decided to earmark for certain foods? To this end, I thought I’d document a day of low-carb eating. See what you think. 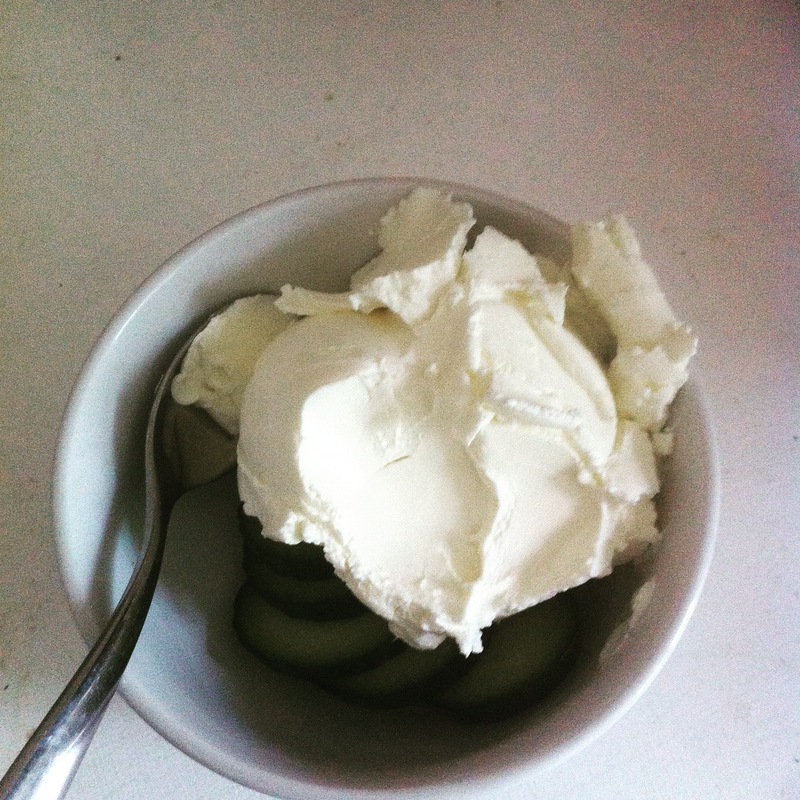 Cream cheese and cucumber slices. We’ve been growing cucumbers this year – successfully too. I sliced some up and had them with some Asda soft cheese. It looks a bit like ice-cream doesn’t it? 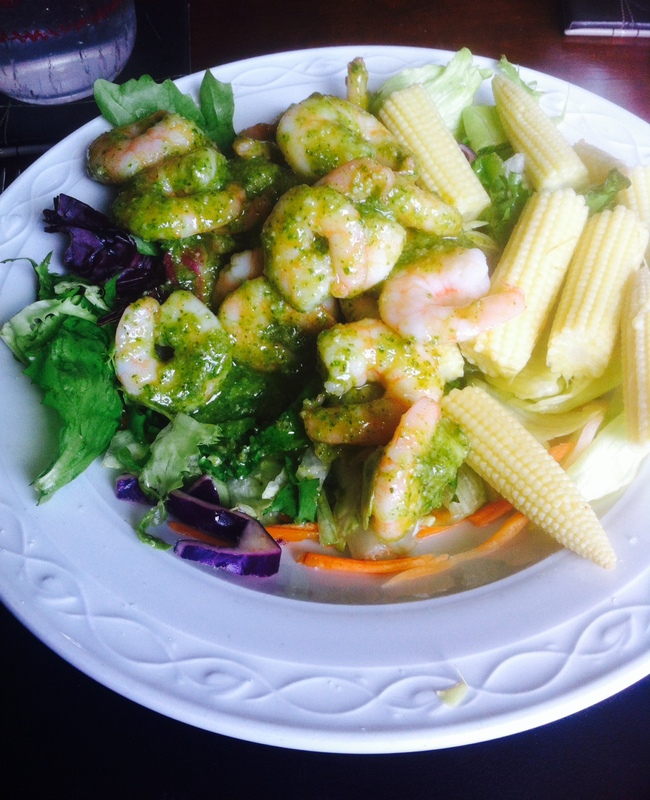 Prawns in home-made pesto, with baby sweet corn. I’ve got a couple of basil plants so I stripped the leaves from most of one, and blended them with 150ml extra virgin olive oil, one clove of garlic, salt, 40g sunflower seeds and 40g grated Parmesan. I use sunflower seeds rather than the traditional pine nuts as sunflower seeds are much cheaper. This quantity will make you enough pesto to last a week. Store it in the fridge and use as a salad dressing, mixed with roast aubergines, peppers and courgettes, or spread on top of roast chicken. 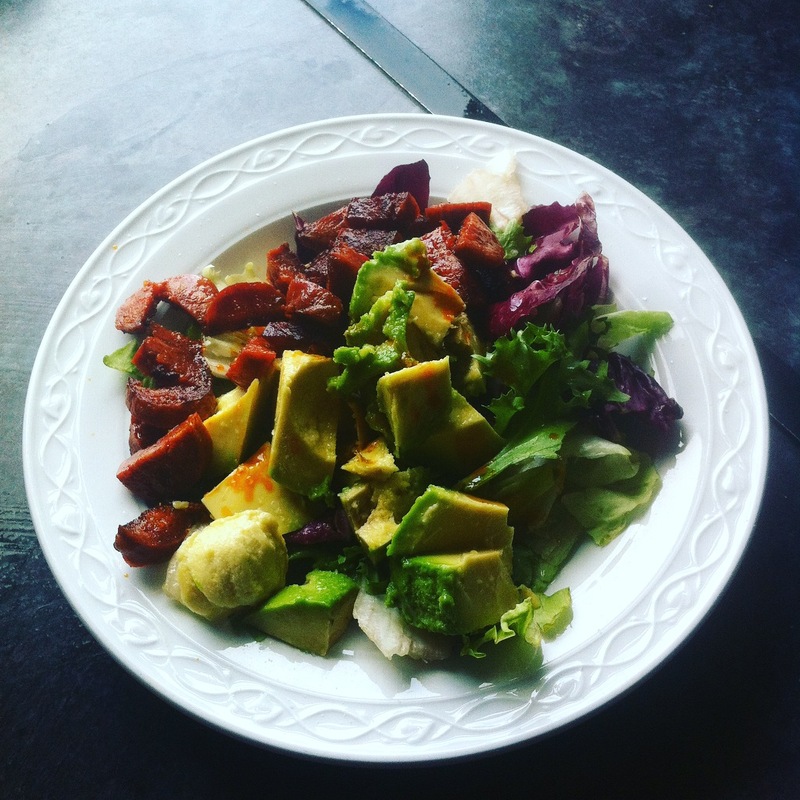 Avocado and chorizo salad. Recipe here. I also ate an apple and cheese. The carbohydrate count for the whole day was roughly 50g. What do you eat? What’s your favourite meal of the day – or your best meal? Let us know in the comments. Disclaimer: my meal choices are not necessarily recommendations – it’s just what I ate one particular day. Next Post Dana Carpender: What Health Conditions Respond to Low Carb Diets? Great idea to add sunflower seeds to the pesto! BTW, pesto freezes well. Thanks Jan! Freezing pesto is a good idea because it’s difficult to use it all up, even with the best will in the world.